Before Flight of the Concords, Tenacious D ruled the musical comedy world. Their earnest delivery of some of the most absurd lyrics you'll ever hear put Jack Black and Kyle Gass on the map years and years ago, even before Black became a household name through acting. So at this point, do they have anything else to prove? Well, no. Maybe that's the point: after huge productions like The Pick of Destiny, they're using this time of their careers to write whatever they want and ensure there's a lot of dicks involved either way. So in case you were wondering: no, Tenacious D haven’t really grown up all that much. Part 2 of the show gave the people what they really wanted, though. 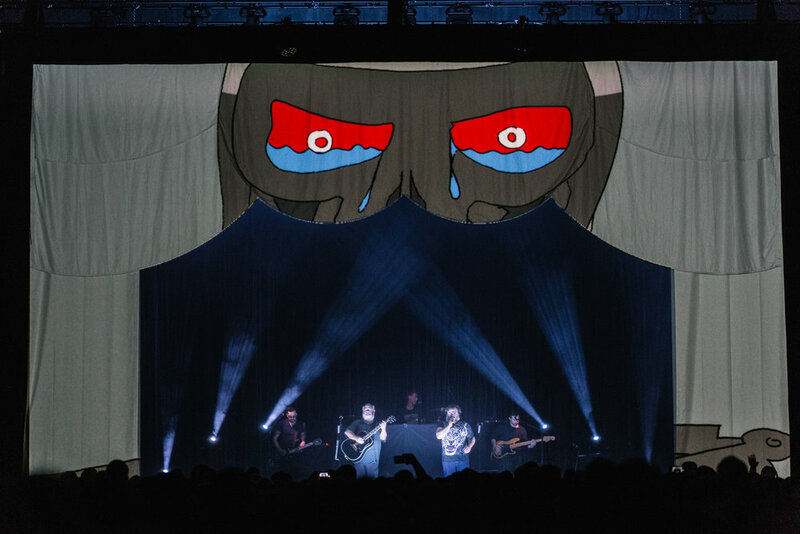 The projected screen in the front of the stage raised, and they quickly launched into some fan favorites that spanned the history of the band, complete with unique (and yes, sometimes vulgar) projections that enveloped the stage. "The Metal" had people putting a whole lot of devil horns in the air as the band shredded away. Black's still got the pipes to yell out those soaring highs that made songs so memorable, too. Gass and Black are still having a lot of fun on stage - why else would they perform their encore in classic DC tourist fashion - wearing matching Uncle Sam top hats? As long as they’ve got their acoustic guitars to thrash on, Tenacious D will always be there to entertain the masses, irreverent and hard-rocking as ever. Post-Apocalypto is out now on Columbia Records. Opening for Tenacious D were southern rock duo Wynchester, whose interweaving acoustic finger-picking style served both their originals and covers (like Lionel Richie’s “Easy”) impeccably well. Their self-titled debut album is out now on Space Horse Records.